Tandragee (from Irish: Tóin re Gaoith, meaning "backside to the wind") is a village on the Cusher River in County Armagh, Northern Ireland. It is situated in the civil parish of Ballymore and the historic barony of Orior Lower. It had a population of 3,486 people in the 2011 Census. Overlooking the village is Tandragee Castle. Originally the seat of the O'Hanlon sept, it was taken over by the English during the Plantation of Ulster and rebuilt in about 1837 by George Montagu, 6th Duke of Manchester. Today, its grounds are home to the Tayto potato-crisp factory. 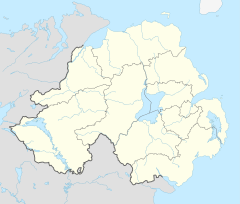 Northern Ireland Electricity has an interconnector to County Louth in the Republic of Ireland from the outskirts of the town. Earlier spellings of the town's name include Tanderagee and Tonregee. They come from Tóin re Gaoith, which refers to the hillside on which the village is built. Tandragee Rovers play in the Mid-Ulster Football League. There is a golf course within the grounds of Tandragee Castle, within walking distance of the main street. It is 5,589 metres, par 71, and a hilly parkland course. Tandragee is also home to the Tandragee 100, a motorcycle road racing event held each year on country roads near the town. Thomas Sinton opened a mill in town in the 1880s, an expansion of his firm from its original premises at nearby Laurelvale - a model village which he built. Sintons' mill, at the banks of the River Cusher, remained in production until the 1990s. The potato-crisp company Tayto has a factory and offices beside Tandragee Castle. It offers guided tours. Tanderagee railway station opened on 6 January 1852 and was shut on 4 January 1965. There is an airstrip for landing and taking off of small aircraft near the old porridge factory. It had a population of 3,486 people (1,382 households) in the 2011 Census. 2.0% of people aged 16–74 were unemployed. Wikimedia Commons has media related to Tandragee. ^ "Tandragee". IreAtlas Townlands Database. Retrieved 13 May 2015. ^ a b "Tandragee". Census 2011 Results. NI Statistics and Research Agency. Retrieved 30 April 2015. ^ "Tandragee station" (PDF). Railscot - Irish Railways. Retrieved 2007-11-24. This page was last edited on 3 November 2018, at 19:30 (UTC).